I mentioned earlier this week that Walmart has Gift Sets 50% off. They still have many available, and not all of them will have to wait until next Christmas to be unwrapped. 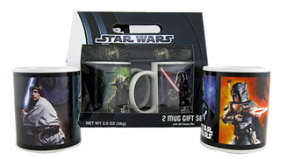 For any that don’t like Star Wars, there are also great gift sets on Starbucks items! These could make great thank you gifts or hostess gifts.